The Spotted Copella or Copella nattereri is graceful swimmer and has a series of spots on its body. This species of fish only grows up to 8 cm in length and has very larges eyes for the size of its body. They are considered to be a peaceful community fish which makes them perfect for the beginning aquarium enthusiast. 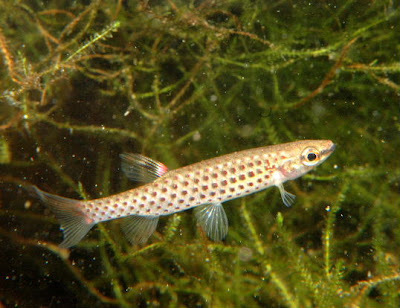 The Spotted Copella is a freshwater fish that enjoys temperatures of 22 to 28 degrees Celsius. These fish breed by laying its eggs on underwater plants. It only takes a day or two before the fry start hatching. The Spotted Copella is native to the Amazon Basin. If you have any additional information about the Spotted Copella including care tips please share!